Opening a coffee shop can be extremely profitable. Pass by any busy specialty coffee shop and it will likely be full of customers enjoying coffee, espresso, lattés, teas and a variety of pastries and other goodies. Serving quality coffees and snacks in a trendy, relaxing atmosphere is a hugely successful business model pioneered by Starbucks, which has grown to over 25,000 coffeehouse locations around the world. If you love coffee and are looking for a business opportunity, here's how to start a coffee shop and make it a success. Purchasing a franchise, in which case most of the major business decisions will be made for you. For a franchise fee, you will be provided with a turnkey business in a location selected by the provider of the franchise. Buying an existing business. This is another way to acquire a turnkey operation. However, finding a profitable business for sale is not an easy task. Starting from scratch. This option requires the most effort but has the most flexibility and the best potential to maximize profits. Whichever option you choose, the same fundamentals for success apply. Your business plan for how to start a coffee shop should incorporate the following key factors. 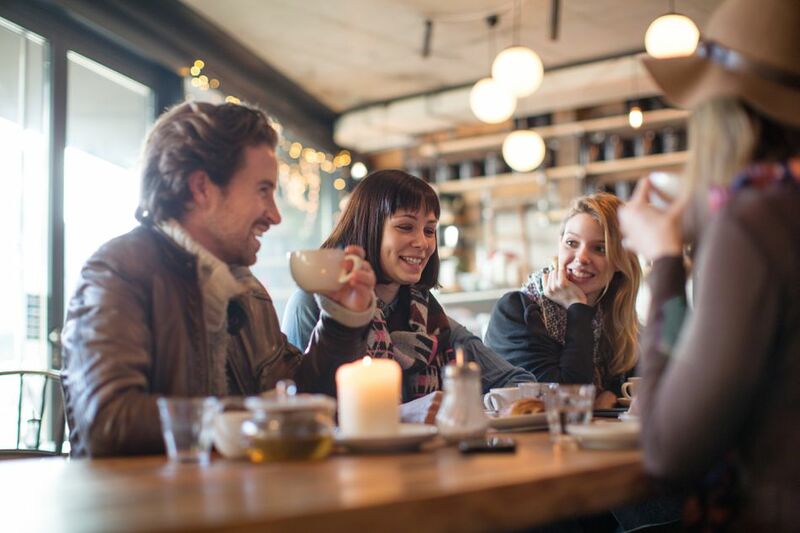 Coffee shops are great places to socialize - Statistics show that coffee shops are the most popular place to meet friends. They are also a preferred spot for individuals looking to pass the time reading a book or magazine or surfing the web while consuming a beverage and/or snack. Coffee shops are a popular place for informal business meetings or for students to catch up on schoolwork. Walk into any popular coffee shop and chances are you will see a realtor reviewing listings with a client or a group of students collaborating on a school project. Given the above having a great location is obviously very important for attracting customers when you're opening a coffee shop. If you are franchising or buying an existing business the location is pre-selected but you should still do your research and decide whether the existing or selected location is a good one. Note that the most central locations are not necessarily the best for your bottom line. Malls and other high traffic locations typically have the highest rents and often the most competition. Storefronts are excellent locations for coffee shops - they have the highest visibility, the rents are usually lower than in malls, and you can set your own business hours (as opposed to a mall where your opening and closing hours are normally the same as the mall hours). Unless you do locate in a mall or other high-pedestrian traffic site there needs to be easy access and adequate parking available for vehicle traffic. If a customer has to make a difficult turn off a busy street to get to your establishment or finding available parking around your coffee shop is difficult, they are likely to take their business elsewhere. Ideally, you want a convenient, highly visible location on a busy street with plenty of parking so customers can easily drop in on their way to or from work or school. With the popularity of cycling growing by leaps and bounds having a secure lock up rack for bikes is always a good idea. In my small town, a recently opened coffee shop has become an overnight success - in no small part due to the location which is near a busy crossroads with a lot of vehicle, pedestrian, and bicycle traffic and plenty of available parking. When opening a coffee shop, consider that gourmet coffee/tea drinkers want more than a mug of ordinary joe or a teabag in a foam cup. According to the Specialty Coffee Association of America, 37 percent of coffee sold is of the specialty variety, and specialty coffees make up more than 50 percent of the retail value of the U.S. coffee market. Buy a high-quality espresso machine and related equipment such as grinders, water purifiers, etc. Offer innovative products like Frappuccinos, Chai Lattes, etc. Excellent customer service is the hallmark of any successful business, and most especially in the food services industry. Combine a great location, top quality products, and great customer service and chances are you will have a very successful coffee shop. Surveys show that four out of five customers rank customer service as very important - one of the main reasons for Starbucks' success is their professional and efficient service. Most successful coffee shops utilize counter service. Having customers order and pay upfront and calling them when their drinks and snacks are ready minimizes your labor costs and enables you to better handle busy periods such as breakfast and lunch. Table service is generally slower, more labor-intensive, and better suited to restaurants where patrons order full meals and spend more time in the establishment. Having table service does give more opportunity to upsell the customer with desserts and/or snacks. Surveys have shown that most people believe atmosphere is one of the biggest attractions for a café. Starbucks' relaxing, cozy, comfortable atmosphere is one of the major contributors to their success. When opening a coffee shop, having the right atmosphere is key to attracting customers that like to ​hang out with friends or business associates and (hopefully) consume additional products such as snacks, pastries, etc. Go into any popular coffee shop on a weekday afternoon and chances are you will see groups of students doing their assignments (rather than in the school library or cafeteria). The ideal atmosphere is clean and bright with plenty of natural light and comfortable seating space. Be sure to have plenty of premises lighting for evenings and dull days. Having an outdoor patio space is a huge attraction in season and greatly increases the visibility of your business. Use a mix of seating and table types (such as bench tables) so you can accommodate single customers as well as groups of various sizes. Unless you are a design pro, consider using an experienced interior decorator to design the interior of your premises. You want that distinctive, personalized ambiance that will draw in customers and that involves all the design elements: layout, furniture, decorations, lighting, flooring, etc. Another key to success when planning how to start a coffee shop is to realize that while coffee and tea have a high markup (up to 80 percent on specialty coffees) a coffee shop cannot survive on coffee sales alone. Multiple sales are a must. Having an assortment of quality snacks on display at the counter will tempt the customer to make an additional purchase. Make sure to recommend a food choice to the customer at checkout time if they are only ordering coffee or tea. For efficiency, the food items should either be pre-made or purchased from vendors. Preparing made-to-order food (such as sandwiches, etc.) is time-consuming and reduces overall sales volume, particularly in busy periods. Baked goods can be sourced wholesale from local bakeries. Assuming you are serving a great product in a good location, having a loyalty card program can be the icing on the cake for customers and really help you build up a clientele. Getting a free espresso or latté on a loyalty card after 10 prior purchases will put a smile on anyone's face. Make sure to use good quality cards that have your business name and logo prominently displayed and won't easily disintegrate from being in wallets or purses. As with any customer service intensive business, when you're running a coffee shop the owner should be present and fully engaged with the business as much as possible. For many customers the sign of a good business is seeing the owner front and center taking orders, serving, and greeting and conversing with the public. Having a hands-on presence also helps to motivate staff to perform at their best. If you are unable to be present finding a good manager is essential. Most cafés offer free WiFi as a convenience to customers who like to use their mobile devices in order to do business, schoolwork, or just web surf while having a coffee and/or snack. All large coffee chains such as Starbucks provide free WiFi for their customers. However, a growing number of independent coffee shops are pulling the plug on free WiFi and/or banning laptops and tablets in an attempt to create a more communal atmosphere where people converse rather than immerse themselves in the internet. For some people, walking into a coffee shop and seeing everyone typing on a laptop or tablet is a turnoff and they tend to take their business elsewhere. In some cases not having WiFi has actually resulted in increased profits, as people using mobile devices may tend to spend more time but less money in the establishment. Some coffee shops have compromised by not allowing laptops and mobile devices during busy periods such as lunch hours. Ultimately whether you decide to have free WiFi or not should be a business decision based on the customers' wants and needs - people will patronize your establishment if they can do the things they enjoy doing.